I’m excited to be able to finally share a project that we’ve been working on for a bit here at eightninety headquarters. 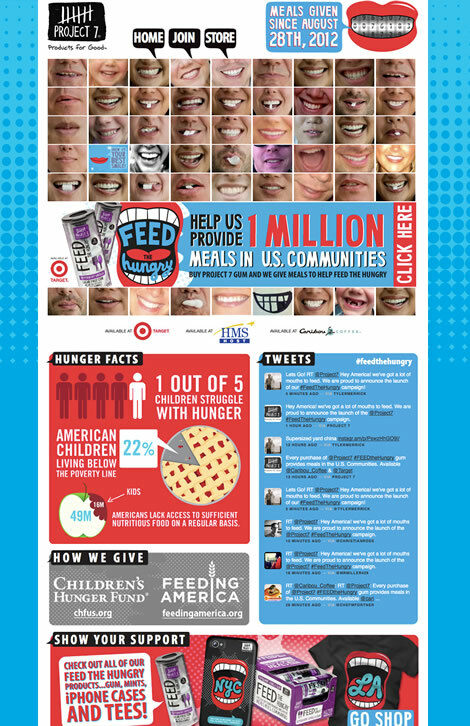 We were lucky to be able to partner with Project 7 to build a custom application to help launch/promote their newest goal – provide one million meals to those in need. Honestly though, who wouldn’t be excited to participate in something like that? Luckily you can be a part as well – anytime you buy a Project 7 product you are automatically helping the cause (or seven causes, as it is). You can also help by heading over to the Feed campaign site, submitting your smile, applying to be a “Feedvocate” for your area, and spreading the word to anyone who will listen. Thankfully, dealing with hunger is a pretty attainable goal and one we can all work towards together. You can buy Project 7 products in plenty of places including their newest retail partner (and every wife’s favorite store), Target. EDIT: There’s a number of ‘Easter eggs’ hidden throughout the site, if you can find them all, I’ll buy you a pack of Project 7 gum. Project 7 is a consumer goods company that harnesses the power of everyday purchases in order to create a positive impact in American communities and abroad. In 2008 Tyler Merrick created Project 7 to give people a high quality product at a competitive price and one that gives back at the same time. The products created under the Project 7 umbrella, include mints, gum, coffee, water and tees and are distributed nationally in over 7,000 stores from coffee shops and grocery stores to mass retailers including Wal Mart and Target. For every purchase of a Project 7 product, good is done in one of the seven areas of need in the United States – Feed the Hungry, Heal the Sick, Hope for Peace, House the Homeless, Save the Earth, Quench the Thirsty and Teach them Well.